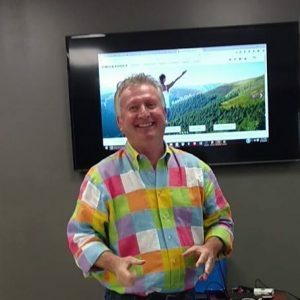 As a Toastmaster and Inspirational Speaker since 1995, Chuck Dodge is committed to helping people create the abundant life they deserve in spirit, mind and body. He has been branded as Mr. Enthusiasm. It is through his speaking and training sessions that people change their perspective about their lives. Chuck’s business, Making The Connection, is focused on helping individuals discover, develop, and display their talent and be more expressive with their talents, skills and abilities. This is accomplished through his premier programs: Think On Your Feet workshops, the Disc personal profile and his presentation of Possibilities Beyond Circumstances. In the 90’s Chuck began his career as a speaker. It is enjoyable to share ideas with others that can help them create what they want. His speaking has included work with: All State, Taco Bell, Citizen’s Bank, Troy Public Library, Garrow Loftis Real Estate, Davenport University, ITT Technical Institute (Troy), Rotary, Kiwanis, Optimist Clubs, Career Alliance, Community Education and several other groups. He is also the promoter of three books: Think On Your Feet, Integrity, and The Vision of Habakkuk. For more information about Chuck Dodge, visit http://chuckdodge.com. Check out this message from Chuck!